Sit-ins of both Pakistan Tehreek-e-Insaf (PTI) and Pakistan Awami Tehreek (PAT) are taking place in Islamabad for last 9 days. The call for revolution by Tahir ul Qadri and the demand to dissolve Nawaz Sharif government, on pretext of election riggings, by Imran Khan has created a storm in Political landscape of Pakistan. There is no doubt that the method of bringing change in the government and system by both agitating parties is entirely wrong. Similarly, any military intervention will result in ultimate destruction of Pakistan. However, one can’t ignore all those who have jumped the bandwagon to save democracy in Pakistan. All those who have come to save the democracy are actually the beneficiaries of this corrupt system. Change of power will deprive them from the benefits that they are getting from this system. The current system is at best a civilian dictatorship in the guise of democracy. Let’s not forget that the entire political system is product of controversial and massively rigged elections. This government doesn’t enjoy the same level of legitimacy as another government which had come to power through fair and free elections. Asif Zaradri, former president of Pakistan and co-chairman of Pakistan People’s Party (PPP) came to save the democracy. He vowed to support the ministry of Nawaz Sharif despite stiff opposition from his party leaders from Punjab, most notably former Prime Minister Yousaf Raza Gillani. The reason that Asif Zardai wants to protect this system is that he is a beneficiary of the system. He has got the control of Sindh and corruption cases against him are being prosecuted at snail’s pace. So it makes perfect sense why Mr. Zardari would do all he can to save this democracy. Likewise, Mahmood Khan Achakzai, Hasil Bizenjo and Molana Fazal-ur-Rehman are not behind in the race to prove their pro-democratic credentials. Are they doing it for the love of democracy unconditionally? Or they are getting something from this system? Balochistan assembly, which has failed to bring any change in Balochistan, passed a resolution against sit-ins in Islamabad. Mahmood Achakzai is unofficial advisor of Prime Minister, his brother is governor of Balochistan and his party is a part of Balochistan government. Hasil Bizenjo’s party in Balochistan has the control of office of chief minister, what else can he ask for? Molana Fazal-ur-Rehman has got four ministries in this government; a federal minister, a state minister, chairman Islamic Ideology council and chairmanship of Kashmir committee. This information makes it clear that why all the three aforementioned veteran politicians love this democracy so much. Furthermore, the worst part about the supporters of democracy is the involvement of extremist organizations. Some sectarian extremist organizations, that are involved in declaring members of a sect as apostates are on the fore front of defending this democracy. A rally in support of this system was carried by sectarian party leaders in Islamabad on Friday. Apart from that most of religious political parties, who normally consider democracy to be un-Islamic western menace, have jumped the bandwagon of defending democracy. Why are they doing it? The answer is that all these religious parties have stakes in this system and they can’t afford to lose this system. Moving to the electronic media, Geo has proved to be the New PTV in this case. Not to mention TV channels Like ARY News, which is known to be partial since day one. GEO is viciously criticizing the Azadi Match and Inqilab march and doesn’t miss any opportunity to criticize PTI and PAT. All the support that Geo had acquired by standing against powerful forces few months back has gone down the drain. Why Geo has become a party to the current political situation rather than being a neutral media group? GEO requires the Nawaz government for its survival in the back drop of Hamid Mir assassination attempt crisis. When Zardai was in government, GEO showed no love for the democratic system and viciously criticized PPP government to the extent that democracy was in danger. Nawaz Sharif has turned out to be the defender of democracy and using He is using democracy to save his government. It’s a fact that he came to power after controversial elections and there is ample evidence available to prove that. Democratic principle’s application is restricted to getting power only and not while exercising power. In any democratic society the government had to take stern action against any incident like model town incident. Model town incident was the worst example of state terrorism in Punjab. The involvement of PMLN government is crystal clear in that incident. Shehbaz Sharif is acting like a civilian dictator and preventing the rule of law take its course. So when it comes to covering up their blunders, The Sharifs don’t mind acting like dictators but still they claim to be democratic leaders. A major part of civil society of Pakistan has launched a barrage of criticism against Imran Khan and Tahir ul Qadri. 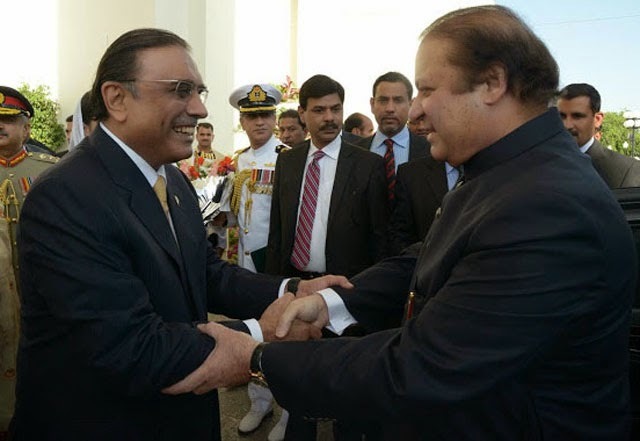 There is no doubt that these two gentlemen are worried about their personal interests rather than the well being of people of Pakistan. However it’s most unfortunate the way many educated and progressive people are mistakenly defending the civilian dictatorship of Nawaz Sharif in the name of democracy. The misplaced criticism against Imran Khan and Tahir ul Qadri is only strengthening the monarchical rule of Sharifs. In other words, the system that economically exploits hundreds of millions of Pakistanis is getting its strength due to speculations of martial law. All those who have joined the battle of defending the democracy in Pakistan are actually supporting the oppression of masses in the name of democracy.